The crowd here is a mix of biologists, military vets, TV hunting personalities, former hippies, and ardent Trump supporters. All are dedicated to one issue: the preservation of America’s wild public lands. Many are wearing sweatshirts emblazoned with the phrase public land owner, a rallying cry for the nonprofit group. During an awards luncheon, a muscled guy from Wyoming says he’s skeptical of climate change but nonetheless opposes the state’s Republican congresswoman, Liz Cheney, on account of her support for transferring federal lands to the states. At an outdoor wild-game feast, I run into a blue-eyed 33-year-old woman named Lauren, who says she got into hunting because “I thought it was important to take responsibility for meat-eating, karmically.” Now she’s hooked on killing. Her entry in the cook-off is a cougar pinwheel roast stuffed with morels. Across the tent, a reddish-blond man in a blue shirt and camo vest yucks it up with a handful of brawny guys drinking beer. Land Tawney, BHA’s 42-year-old president, is a ruddy-faced, fifth-generation Montanan who calls creeks “cricks” and could fit a pen in the gap between his front teeth. He owns more than 20 guns. In an era when much of the GOP is intent on transferring or selling off vast swaths of public land (mostly in the West), Tawney represents an aggressive line of defense for America’s wild places. Since he took the reins in 2013, BHA has grown tenfold, largely because of Tawney’s ability to create this bipartisan coalition. One of his more charming habits is a tendency to compare politicians to dogs. “The dog understands the stick,” Tawney says, “and so do politicians.” Recently he has been using the stick to great effect. This spring, Tawney took on former Utah Congressman Jason Chaffetz — who resigned in the summer to take a job as a political pundit at Fox News — after the representative introduced a bill to “dispose” of 3 million acres of federally managed public land. Tawney countered by mounting a fierce grassroots response: At a rally at Montana’s capitol organized by his group, a thousand protesters in cowboy hats and camo crammed the corridors, denouncing the bill. At that, Tawney stands up, pumps his fist, and howls thunderously. Public land in America exists largely because of hunters. Theodore Roosevelt and George Bird Grinnell formed the Boone and Crockett Club in 1887 in order to protect Yellowstone National Park from mining and railroad interests. The group was responsible for many of conservation’s early victories, including legislation allowing the president to set aside “forest reserves” — a crucial precursor to Roosevelt’s establishment of national forests and monuments. In the latter half of the 20th century, however, hunters slowly ceded much of their political clout to the National Rifle Association, which mostly focused its efforts on fighting gun control. So protection of public lands often fell to big legacy organizations, including the Nature Conservancy, or left-leaning groups like the Wilderness Society, whose environmental concerns often clashed with those of locals dependent on extractive industries — oil and gas workers — as well as with ranchers and loggers. Federal land is managed for “multiple use,” meaning the government’s supervision of it must plan for recreation and conservation in addition to drilling and grazing. But this has created a cauldron of conflicting interests that have occasionally come to a boil. The most recent land-transfer flare-up started roughly five years ago, not long before Nevada rancher Cliven Bundy mounted an armed insurrection against federal agents. It was also around the time when industry-friendly groups had started a campaign to persuade Americans that the government was botching the management of their land. Their general argument is that states can manage the acreage more efficiently than the federal government. But states have a poor track record of keeping the land public: 70 percent of the roughly 200 million acres that were given to states upon their entering the union has since been sold or transferred to private interests such as landowners and companies. Much of the remaining acreage has been leased out to extractive industries that have limited or cut off access. Last summer, the Republican National Committee went so far as to add transfer of lands from the federal government to the states — a process called divestiture — to its platform. Now, under President Trump, pro-transfer Republicans are eager to carry it out, and environmental groups have about as much sway at 1600 Pennsylvania Avenue as Howard Dean. That leaves swing-voting hunters as the rare conservation-minded bloc with access to the administration. So far, in the early days of the Trump administration, Tawney has helped stall the most direct attacks on public land, including Chaffetz’s bill, but there are plenty of worrying developments — most notably a Trump-ordered review of national monuments, including Utah’s Bears Ears, which Zinke recently suggested shrinking. Utah’s congressional delegation, however, would prefer to do away with it altogether. Tawney finds himself in a delicate position. To win his war, he must rally his bipartisan coalition of hunters, anglers, and other conservationists; convince gun lovers to criticize legislators supported by the NRA; and go to battle with land-transfer advocates who are backed by some of the most powerful industry groups and special interests in the country, including the Koch brothers’ network. Tawney often wears muck boots and camo to his office, a brick-walled space where dogs roam freely. Fly-tying materials sit on shelves, and taxidermied ducks adorn the walls. When I come to visit, Tawney’s new puppy, a black Lab named Tule, romps around, and Tawney’s iPhone buzzes constantly. The ringtone is the call of a drake mallard. Tawney is not shy about implying that he was born for this role. One afternoon, while taking me on a tour of his family’s property, in a steep canyon outside Missoula, he notes with pride that Jim Posewitz, the author of Beyond Fair Chase, a seminal backcountry hunting book, drove his mother, Robin, to the hospital on the day of his birth. “My dad was out fishing,” Tawney says, smiling. As a high schooler, Tawney was, in his own words, “a punk kid,” interested primarily in soccer and girls. He went off to college in Seattle, but his father was soon diagnosed with leukemia, and after he died, Tawney moved back to Missoula, where he enrolled at the University of Montana to study wildlife biology. Soon thereafter, he met his wife, Glenna, while teaching soccer, and they moved into a log cabin with no running water that his parents had built. The more confrontational the group was, the more it grew. The first year under Tawney’s leadership, BHA’s membership more than doubled from 1,000 to 2,400. Around the same time, it gained some new enemies. Tawney soon realized that he was in a messaging war. 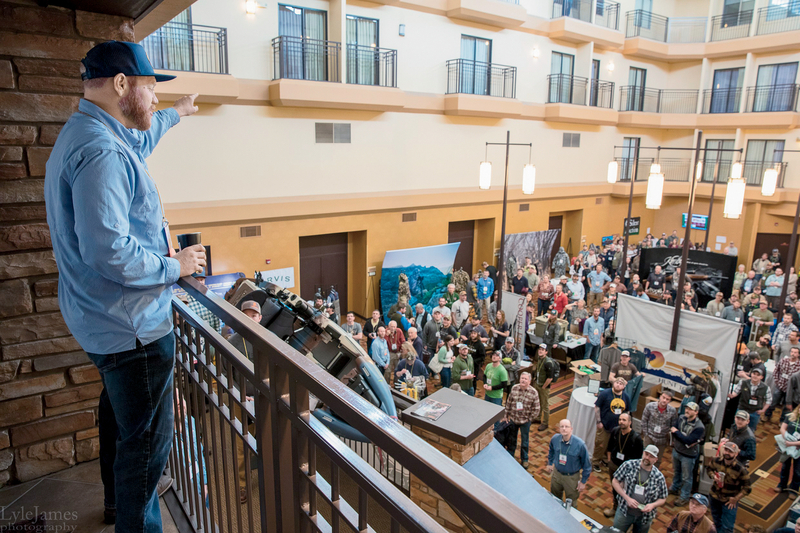 So in the fall of 2014, he organized a pro–public land rally at the Montana capitol, in Helena, giving out T-shirts that read #keepitpublic. When the Bundy brothers occupied the Malheur National Wildlife Refuge in Oregon, Tawney was struck by how easily they were able to convince rural westerners that they were trying to “return” the land to the American people. “I was like, ‘It belongs to us,’ ” says Tawney. He commissioned a batch of hooded sweatshirts bearing the words PUBLIC LAND OWNER, which soon became something of a tribal identification item, the hunter’s equivalent of a MAKE AMERICA GREAT AGAIN hat. Then everyone steps inside the barn to eat, gathering beneath the bleached and mounted skulls of three bull elk. Tawney sits next to the governor. I find myself at a table between two donors. Blake Fischer, a 38-year-old Idahoan and owner of an irrigation business, has well-coiffed hair and a snap-button shirt adorned with two roosters. Baker Leavitt is a brash and bald 41-year-old from Washington. The guys talk football for a minute, and then, inevitably, the conversation turns to bragging about recent kills. Leavitt produces his phone and pulls up a photo of piles of dead feral hogs, which he dispatched using night-vision. Fischer recounts a family javelina-hunting trip to south Texas. Now Tawney starts to mingle, shaking hands and wearing his gap-tooth grin. Midway through the dinner, Tawney stands up to give a sort of keynote speech, and it’s about a recent bighorn ram hunt in Montana. He tells it as the main course is being served — osso buco with risotto cooked in the broth of the ram he shot. At the end, there’s a silence, then Tawney raises a glass. “A lot of people think we’re just doing this so we can shoot the next thing,” he says. “That is not even close to why we are all here.” Then he sits down to eat his kill.